Lattice offers a cheap and simple development board for their MachXO2 FPGA. 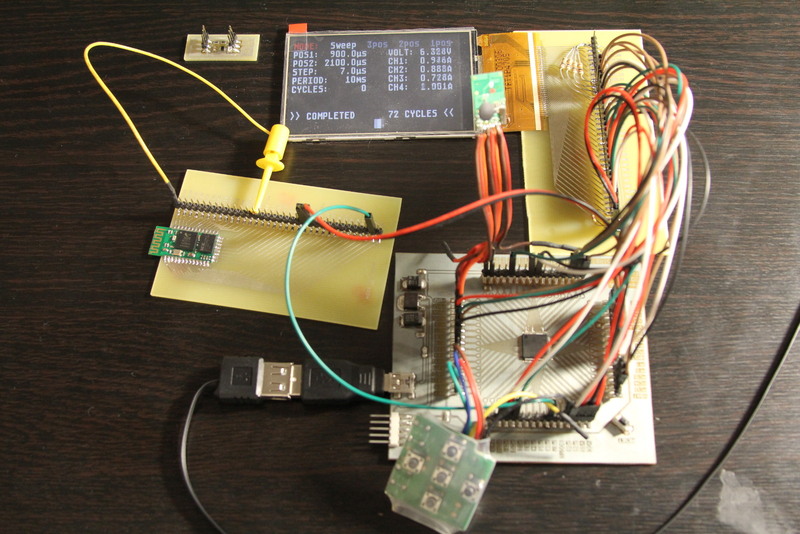 It's just a breakout board with an FPGA, a couple voltage regulators, and an FTDI FT2232 to handle the JTAG stuff. The board is around $25 - $30 from the usual suppliers (Mouser, DigiKey, etc.) This post is my collection of notes for the Lattice Diamond toolchain. 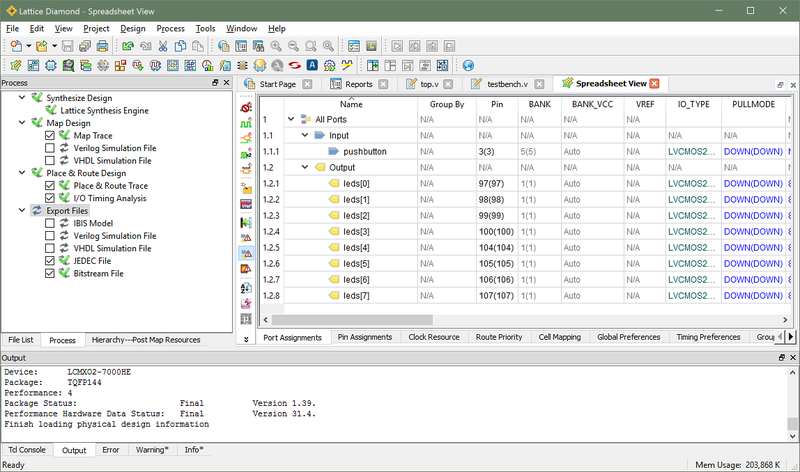 I'll cover the basics of setting up a project, simulating it, programming it to Flash or SRAM, and introduce the embedded logic analyzer tool. To keep this post reasonably short, the project is intentionally trivial. A counter is created and setup to only count up when the user holds down a push button. The 8 MSbits of the count are displayed on the 8 LEDs of the development board. 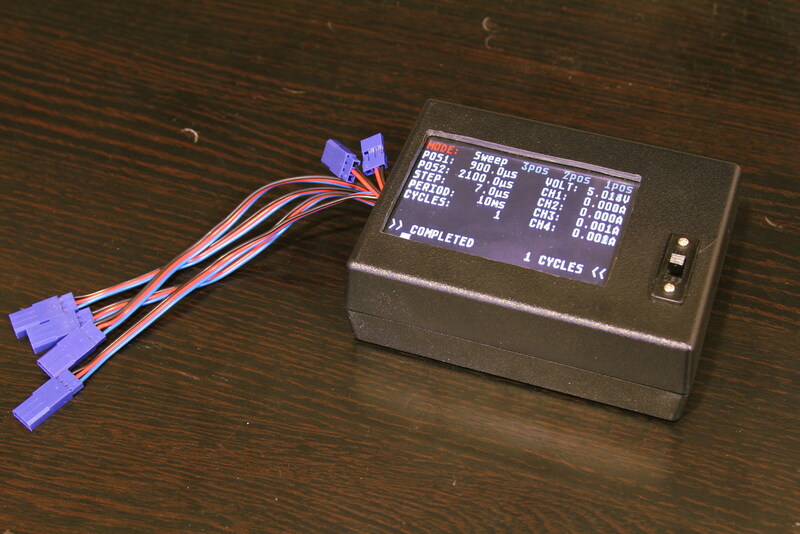 Product page for the development board. User's Guide for the development board. It has the schematic, BoM, and a general explanation of the board. Lattice Diamond (IDE) product page. You'll need to register with Lattice. It's free. Register with a valid e-mail address because they email your license file. Lattice Diamond 3.6 Tutorial. 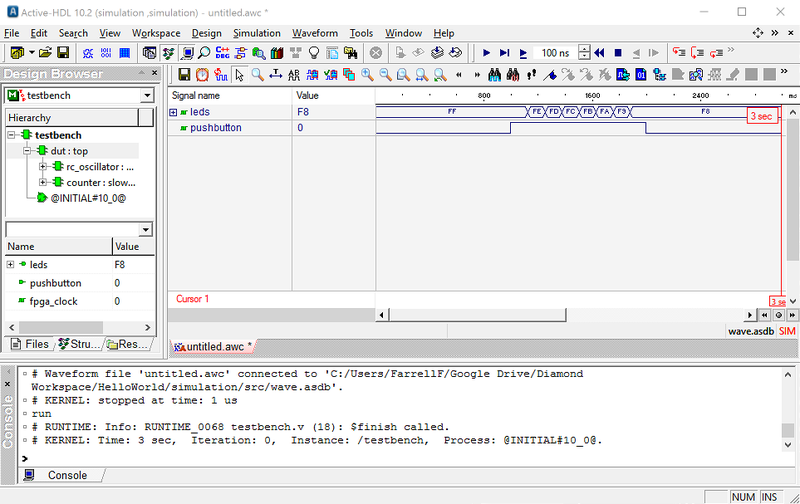 A great introduction that walks you through the basics of the IDE. Lattice Diamond 3.6 User's Guide. Lattice Reveal 3.6 User's Guide. 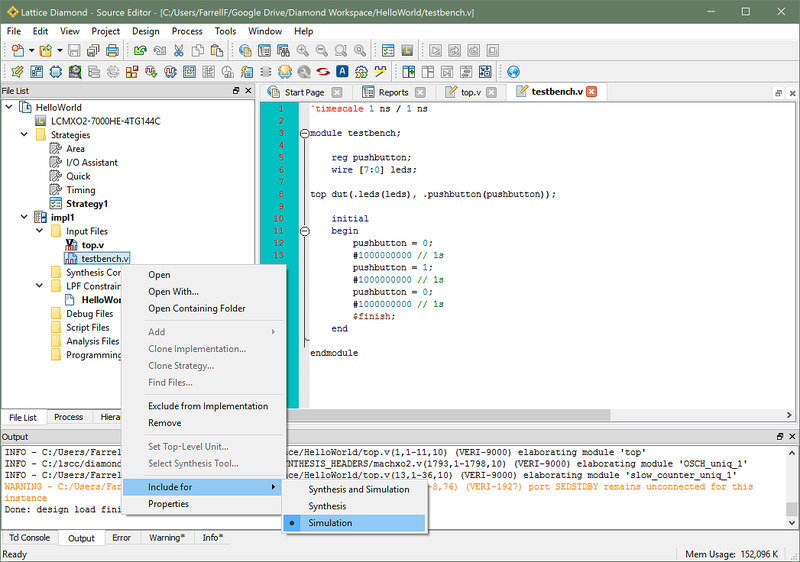 Reveal is their embedded logic analyzer tool. Lattice MachXO2 datasheet. It covers the usual stuff: the family of chips, what's possible, overview of how things work, electrical characteristics, timing, etc. Lattice MachXO2 sysCLOCK PLL Design and Usage Guide. You'll need to instantiate the internal RC oscillator for most projects, and that's covered on pages 28-30. There are lots of other useful documents, but the ones linked above will get things started. Be sure to check out the Documentation sections on the MachXO2 and Diamond product pages. Download Diamond from the link above. Run the installer and let it install all drivers. Open Diamond. The first time you launch it, there will be two errors regarding a missing license file. Click OK both times. When the License Debug window pops up, go to the License Information tab. Note your NIC ID near the bottom of that tab. 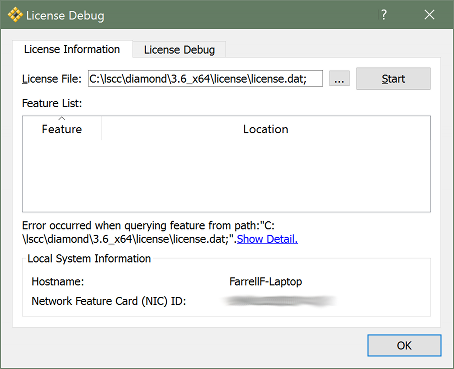 Close the License Debug window by clicking OK. Restart your PC. Yes, this really seems to be required. If you don't, Diamond will repeatedly fail to find the license file. 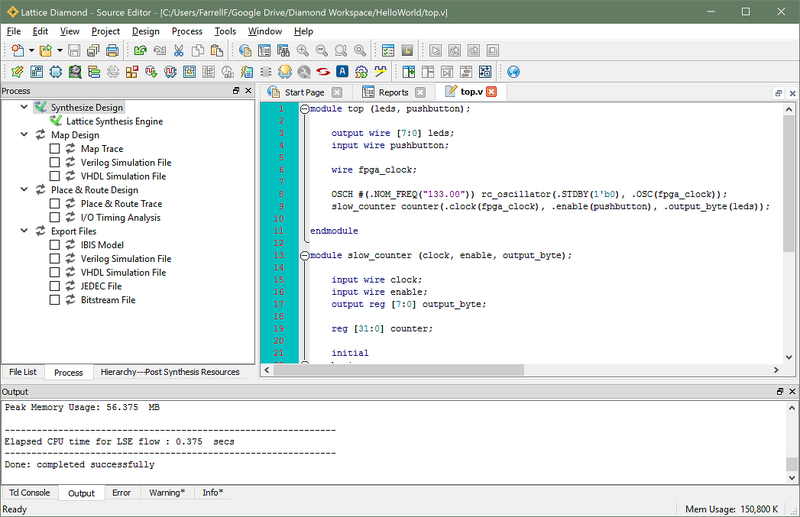 Synthesize the code to make sure there are no errors. A green checkmark indicates success. Mark top.v for "synthesis and simulation" and mark testbench.v for "simulation"
Run the simulation. It will take a while to run because three seconds of time will be simulated. Most simulations run for just a few microseconds, but this is a long run due to the intentionally slow behavior of the LEDs. Zoom the waveform to see all of it. Observe the LEDs slowly changing over time. Note that it looks like a count-down but in real life it will look like a count-up because the LEDs are wired active-low on the PCB. Tools > Spreadsheet View Assign the "leds" nets to the pins for the LEDs. (Pin numbers are on page 13 of the dev board user guide.) Assign the "pushbutton" net to pin 3. 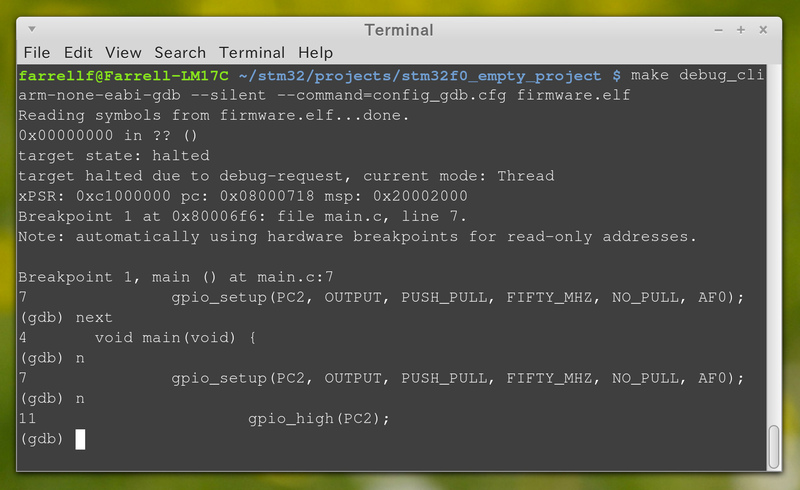 Process tab > Map Design > check "Map Trace" Process tab > Place and Route Design > check "Place and Route Trace" Process tab > Place and Route Design > check "I/O Timing Analysis"
Generate a "JEDEC File" if you want to program to flash, and/or generate a "Bitstream File" if you want to program to SRAM. Process tab > Export Files > check "JEDEC File" Process tab > Export Files > check "Bitstream File" Double-click on Export Files. 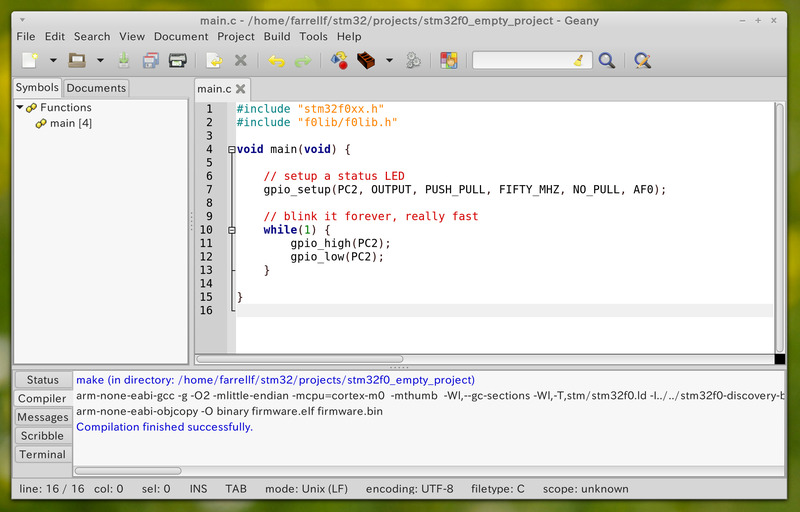 This will generate the files and perform all prerequisite functions. 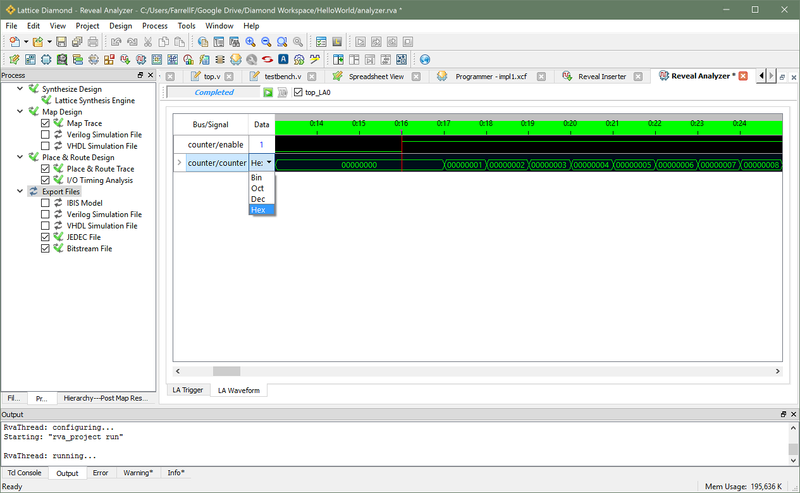 Open Reveal Inserter and specify what signal(s) to "probe" and specify what signal will clock the logic analyzer. I'm probing the counter's enable signal (the pushbutton) and the counter's internal 32bit count. 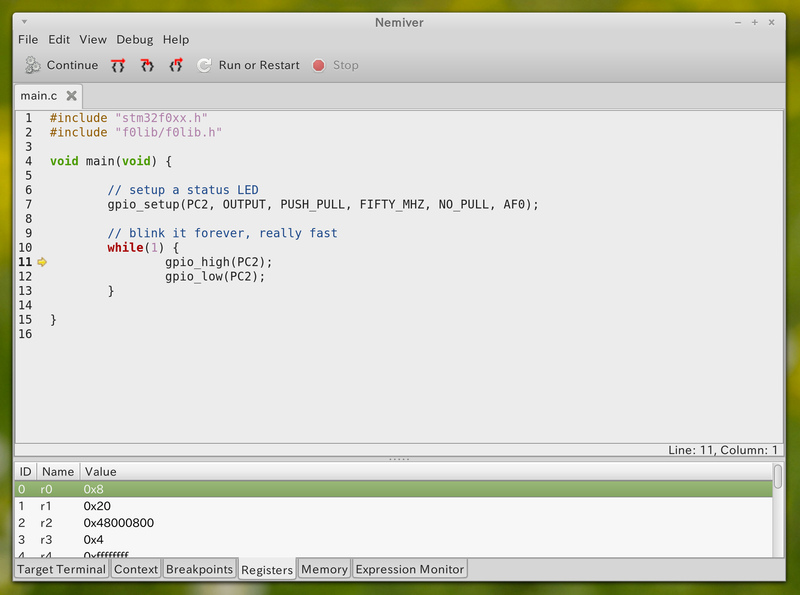 I'm clocking the logic analyzer with the 133MHz FPGA clock. 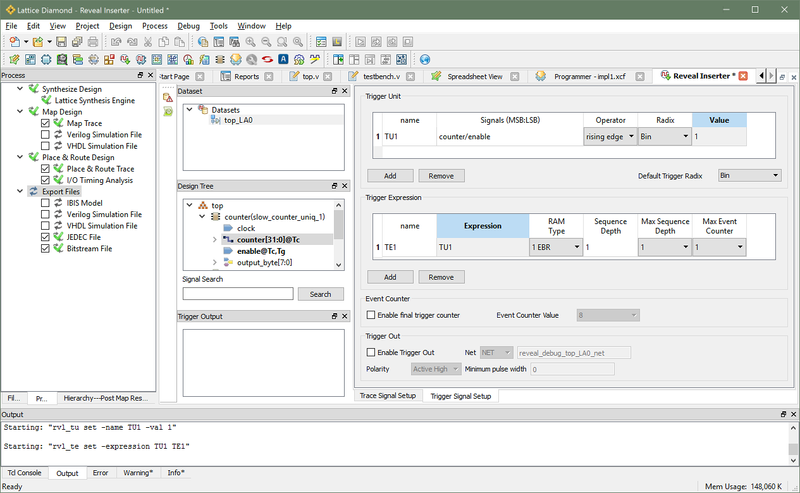 Tools > Reveal Inserter Drag-and-drop any signals you want to probe from the Design Tree over to the Trace area of the Trace Signal Setup tab. 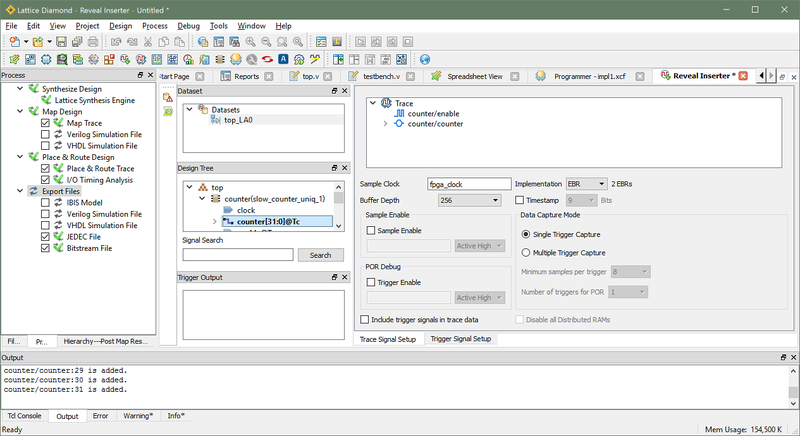 Drag-and-drop your clock signal over to the Sample Clock box of the Trace Signal Setup tab. Specify what signal(s) to trigger off of in the Trigger Unit section. Specify a trigger expression in the Trigger Expression section. I'm triggering off of a rising edge on the counter's enable signal. I don't need a complicated expression, so I just specify the trigger unit as the expression. Click the Run icon (looks like a play symbol) next to Ready "Ready" will change to "Connecting" then "Running" It's now waiting for a trigger. Press the pushbutton to trigger it. You can zoom the waveform with Ctrl-scrollwheel. 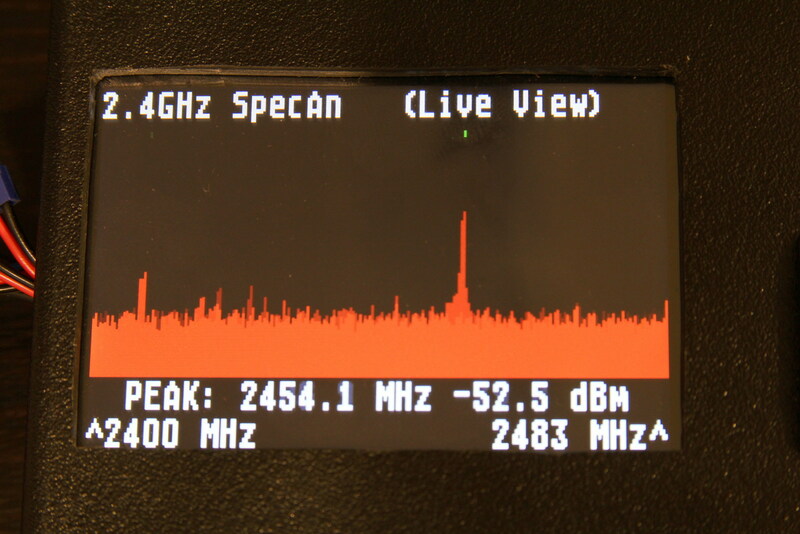 You can change the radix of a multi-bit signal by clicking in the Data column. 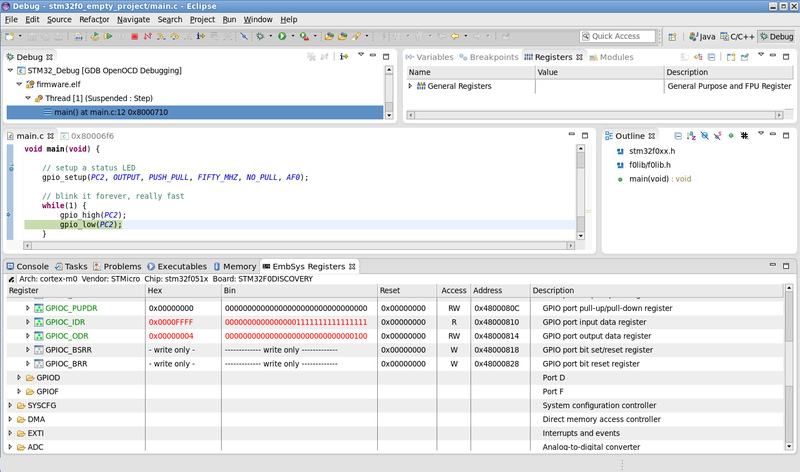 You can re-arm the logic analyzer by clicking the Run icon (play symbol) again. It took quite a bit of work to get this project done. The prototype was a mess of jumper wires and breakout boards. I also started out with push buttons for the user interface but switched to using the touchscreen in an effort to keep things simple. This project marked the first time I have ever had a PCB professionally fab'd. 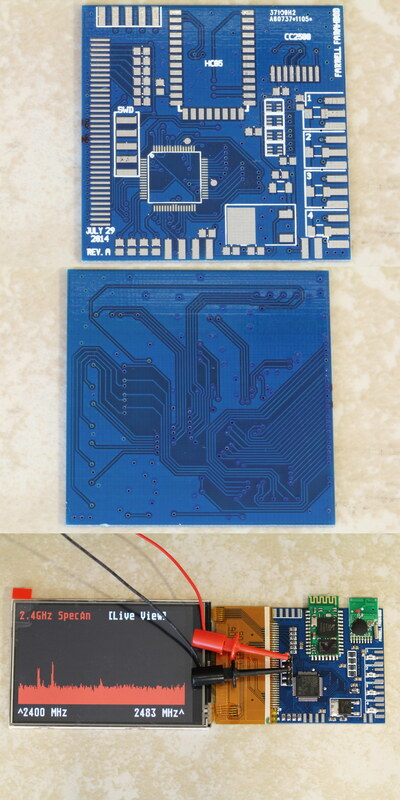 I was very relieved and pleased when everything worked perfectly with the first PCB revision. After I got the PCBs in the mail I checked them over, assembled one board, flashed the firmware... and it worked! 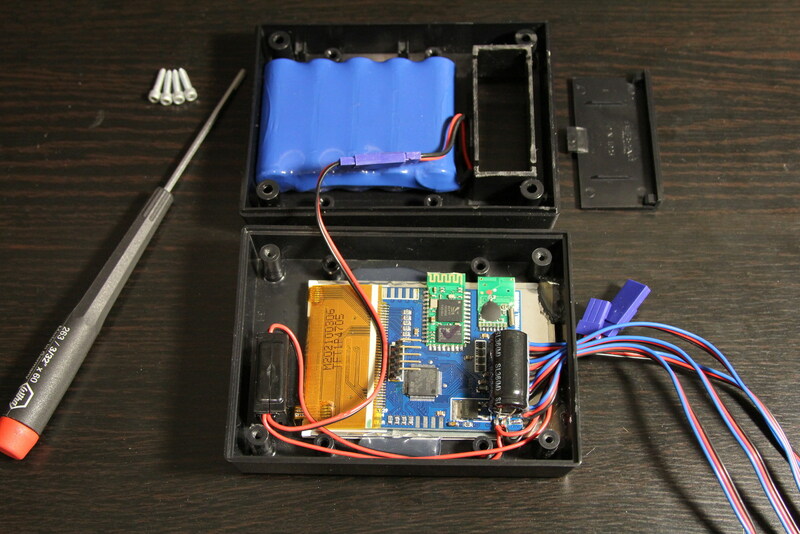 I'll post a video clip and the firmware within the next day or two.